Socket Mobile DuraScan D750 2D & 1D Bluetooth Healthcare Barcode Scanner - Certified by Apple® for iOS devices (iPad®, iPhone®, iTouch®) and compatible with Android, Windows® smartphones and tablets. The DuraScan D750 is a 2 Dimensional Bluetooth® scanner with a highly durable exterior. Built strong for applications in warehouses, outdoor distribution and industrial manufacturing conditions, scanning both 1D and 2D barcodes. The scanner’s IP54-rated outer casing withstands dust and water splashes to keep up with the demands of an industrial work environment. Its antimicrobial material is easy to clean, helping protect from germs picked up with dirt in manufacturing or medical settings. For those physically demanding jobs, the D750 works perfectly in industries like automotive, healthcare, logistics, and more. However, its softer side still remains light and comfortable in hard working hands, yet elegant and sleek enough for more upscale environments with high-end clientele. A DuraScan is welcome in chic settings, like boutiques or showcase events. And with Bluetooth mobility, your DuraScan can keep up appearances and work hard alongside you, no matter where the job takes you. Whether it is a blue collar or white collar industry, DuraScan is suited up and ready for almost any job. 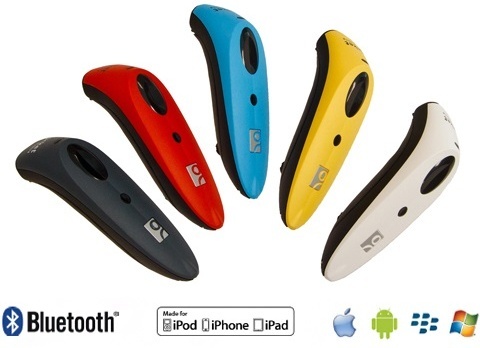 •	Wireless (Bluetooth) scanning for iOS, Android and Windows mobile devices. Bluetooth Profiles: Basic Mode - Human Interface Device (HID)*, Application Mode - Serial Port Profile (SPP) and Application Mode - MFi-SPP. Some Operating Systems or smartphone/tablet models may support only one profile. *By default, the scanner is set to Basic Mode (HID).